The line will be focused on cutting blanks for the automotive sector, up to 3mm thickness and maximum dimensions of 4500 mm x 2500 mm. The feeding line, supplied by SALICO, can receive coils up to 30 Tons and maximum OD of 2.000mm, with coil eye either 508 or 610mm. Once the coils are placed on the entry storage saddles, loading onto uncoiler is automatic. Mandrel design allows handling of both eye dimensions without generating marks or damaging the last wraps of the coil. A pre-leveller with hydraulic guillotine shear in the entry of the line allows cropping for coil head and tail as well as generating samples. This pre-leveller can be driven continuously during line run in order to help the leveller working on the strip, especially for the hardest materials, up to 650 MPa of yield strength. The main leveller, with exchangeable cassettes type, will produce flat strip. In order to cope with complete range of strip thickness (0.5 to 3 mm) and yield strength (up to 650 MPa), it includes two exchangeable cassettes with different work roll diameters. Cassette change over time is performed in a completely automatic way in around 10 minutes time. Entry section fills the pit in a continuous way, being stored enough material by the feeder rollers for the cutting press cycles and matching the requirement of the cutting press being fed in start-stop cycles by the feed rolls. These rolls are positioned in height in order to match different die dimensions and allow cutting with progressive dies, by means of fast opening feature during cutting. Strip threading from one machine to the next one, initial setup of the leveller, as well as strip tail evacuation are highly automated, minimizing the operator intervention. The complete line is protected by a surrounding fencing which, in addition to avoiding operator access to risky areas, allows for scraps and samples evacuation without interfering with the line operation, as well as performing maintenance tasks in a safe way. ARISA is the responsible for the production of the blanking press and the Project integrator of the installation. Company of La Rioja dedicated to the production of presses since 1940, supplies cold formed devices by means of mechanical presses and servopresses of high performances to leader companies all over the world. To speak about the first suppliers for the Gonvarri Group, we have to go back to the 90’s. Since then, this collaboration has been carried out repeatedly with very good experiences. In this case, the press to be delivered is of 8000KN force and has a table and slide dimensions of 4500 x 2500mm. The drive mechanism will be by means of hinged levers, “Link Drive” system, allowing a softer contact between the upper and lower part of the die, obtaining higher qualities of pieces, lower tool weathering, lower vibrations in the press, etc. The safety of the machine will be made by means of safety programmable controllers SIEMENS CPU-315-F 2DP that guarantee the safe running. The visualization screen is a touchscreen SIEMENS MP377 that allows a pleasant and comfortable handling of the press and its automations. The press is equipped with an automatic change of dies by means of moving table with T-Track movements. This will help the increase of productivity of the line, as it will require less time of reference change. All this system is secured by scanners that delimitate the area of die change and make safe the operations. Also, the needed staff for the tool change will be lower increasing the productivity of the installation. The press incorporates a soundproof cabinet system that due to the high sonority of the blank cut, reduce significantly the acoustic pollution of the hall, allowing a workshop more comfortable and safer. Definitely, we can guarantee that the press acquired by Gonvauto Thüringen fulfills the conditions to become a Blanking line of high performance. Since decades Biele S. A. supplies devices to the company Gonvarri S. A. having made more than 150 installations all over the world. Being Gonvarri Group a company in continuous development of new products and new forms of processes optimization in all plants they have worldwide, the demand for improvement is constant. So, now BIELE S. A., together with ARISA and SALICO, is fully undertaken in a new and innovative project for the Gonvarri Group. In the project, BIELE S. A. has developed the stacking device for pieces coming from the press in specific pallets. What characterizes this new installation is the enormous flexibility of adaptation to different forms of pieces stacking. 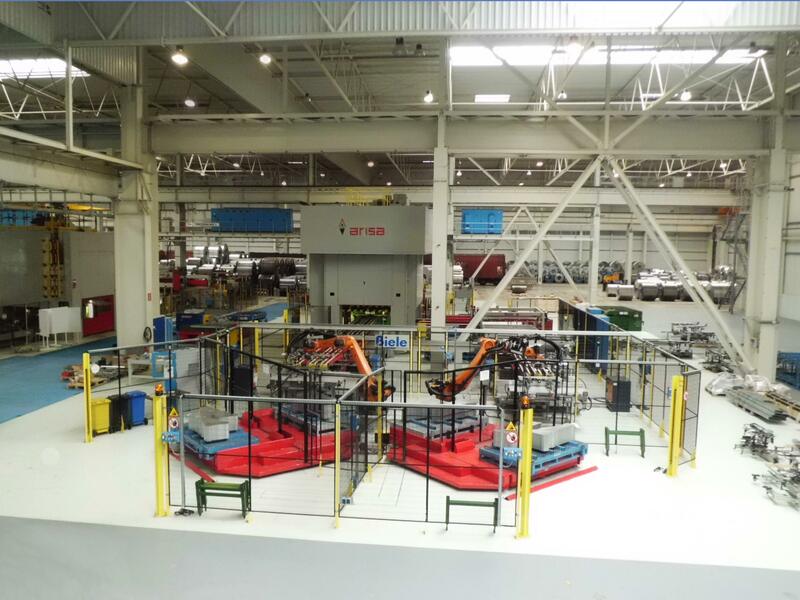 Combining the use of robots with magnetic transporters, tilting transporters, accumulations tables and a complex electronic programming is achieved the stacking directly on pallets and with the form that requires the following manufacturing process of the wide range of pieces that make the inside parts of the carbody, respecting always the production speed that the press line is able to give. The project has required continuous meetings and information exchange between the different technical departments of the involved companies with the technicians of the Gonvarri Group, both in Spain and in Germany, in order to make a safe and comfortable installation and of course with an optimal productivity. The equipment is installed in Germany and the handled product by this line will have as final destination the automobile industry. At these moments, the line is in an advanced trial run period and in the optimization of the processes for several references.